Hi there! How’s your Sunday? Mine was fab: great time at church with friends, yummy crockpot lunch by yours truly, super fun skype on the computer with my dear Deanna while Ezra skyped with Jed on the phone,which led to Ukrainian friends on the Jed-skype asking Deanna on the computer-skype what Ukrainian city she and her husband adopted their baby from (Yep, it was confusing in person too). Ha! I had grand plans to totally unload on you tonight. I was going to fill you in on all my deep thoughts as I begin to really process the trip. You were going to get quite the earful. Lucky you! 😉 Then I started making these cupcakes with Ez and totally mangled my finger in my immersion blender. Turns out it’s not a good idea to stick your finger next to the blade and then accidentally turn the blender on. Oh the blood…nasty. All that to say, typing without your pointer finger is quite laborious, and not exactly conducive to deep thought unloading. Darn. I was feeling really inspired too! On another note, Jed should be in the air right now, heading home to us!!! Yipppppeeeeeeeee!!!!! I can’t wait to be a whole fam again. Next time any of us head across the pond we’ll all be together, and our tickets will be one-way. Crazy, crazy, crazy. Welp, that’s all I got. 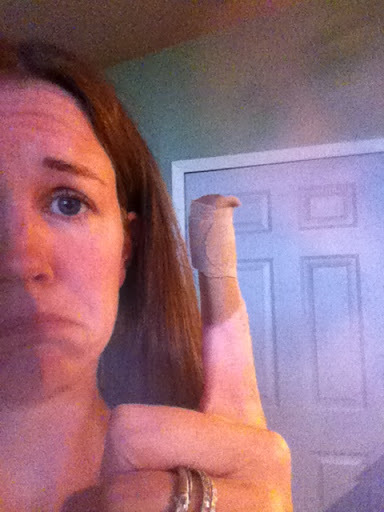 My finger is angry with me so I better go eat another cupcake and watch Call the Midwife. Oh poor you… hugs for you & your finger… on another note, the cupcakes do look so yummy 😉 enjoy!